Epiglottitis is the acute inflammation of the epiglottis and surrounding laryngeal area with the associated edema that needs an emergency situation as the supraglottic area becomes obstructed. Commonly caused by Haemophilus influenzae type B, it affects children ages 2 to 7 years. Children experiencing epiglottis typically appear ill with a high fever, sudden sore throat, muffled voice, rapid respirations, and prefers on sitting upright with the chin extended and mouth open. Drooling is common due to dysphagia and respiratory distress is progressive as the obstruction advances. Once epiglottitis is suspected, no examination of the oropharynx is initiated until emergency equipment and personnel are readily available. The child may need endotracheal intubation or tracheostomy for some cases of severe respiratory distress. Onset is rapid (over 4-12 hours) and breathing pattern usually re-established within 72 hours following intubation and antimicrobial regimen. 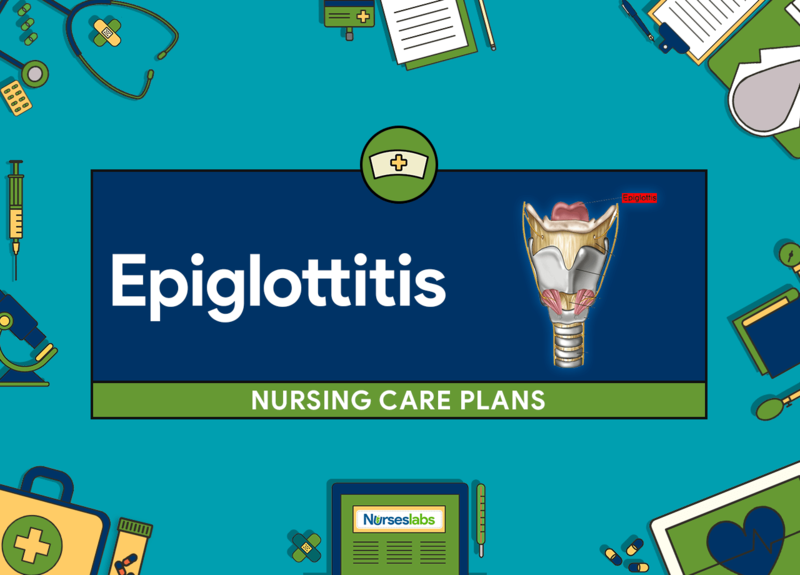 Nursing care planning goals of a child with epiglottitis consists in providing the child with immediate emergency care to avoid the development of further complications. Other goals for the client with epiglottitis are maintaining airway patency, achieving thermoregulation, relieving anxiety, conserving energy to decrease oxygen requirements, enhancing parental/caregiver knowledge and absence of complications. The child’s airway will remain clear. Assess respiratory rate, effort, pattern, and depth. Nasal flaring, rapid breathing, dyspnea, chest retractions, and apnea signifies severe respiratory distress that requires immediate airway support. Auscultate lungs for the presence of normal or adventitious lung sounds. Absent or decreased lung sounds may reveal the presence of a mucous plug or airway obstruction. Stridor is a late ominous sign of epiglottitis that indicates emergency airway management. Encourage oral intake by offering warm, clear fluids. Adequate hydration liquifies thick mucus/secretions. Position the child in a sitting up and leaning forward position with mouth open and tongue out (“tripod” position). Allows maximum entry of air into the lungs for improved oxygenation. Administer humidified oxygen Children need moist air to decrease the epiglottal inflammation and facilitates expectoration. Administer IV antibiotics as ordered. After obtaining blood and epiglottic cultures, second-or-third generation cephalosporins and beta-lactamase resistant antibiotic should be started as soon as possible. Prepare for intubation or tracheostomy; Anticipate the need of an artificial airway. An artificial airway is required to promote oxygenation and ventilation and prevent aspiration.